Lots of exciting things happening at Riot Alliance this summer! Thanks to all who've come out to our summer sales, retail locations, and online! We are extremely grateful for your support of our social justice business model and our social justice partner organizations in Philly! First and foremost, #BlackLivesMatter. The ever-present and recent horrible systemic racist violence against communities of color by the police, and within our system of neoliberal colonial capitalism that continues to oppress people of color every singe day, makes Riot Alliance particularly moved this quarter to partner with Youth United for Change. YUC is a youth-led organization fighting for the educational needs of students of color and from working class communities in Philadelphia. YUC uses a school and community-based organizing model where diverse groups of youth come together to identify concerns in their schools/communities, create strategies for school reforms, and train youth leaders to advocate for these reforms in local, city, and state government. YUC's most recent campaigns focus on expanding water access in schools, establishing community schools and community control of school reform, and increasing the number of school counselors in the public school system. Riot Alliance now sold at Tselaine! 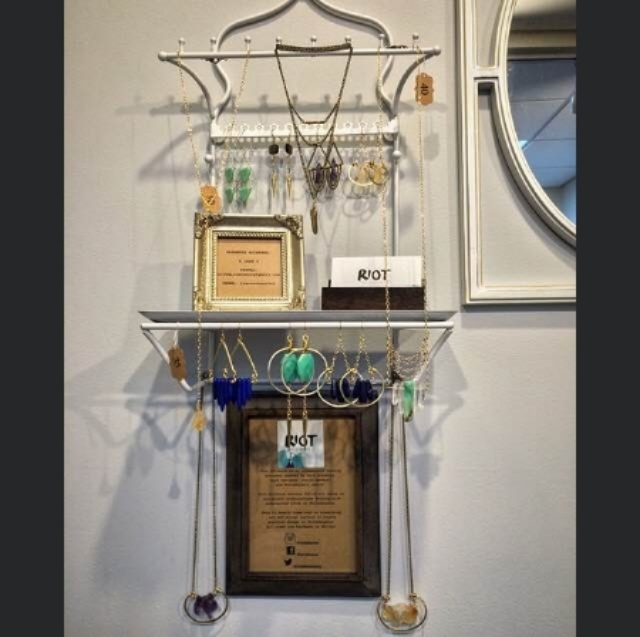 Riot Alliance is super psyched to be one of the many local retailers now sold at Tselaine, an adorable small jewelry and accessories boutique in Rittenhouse. Check out the Riot Alliance display next time you stop by the store! YUC wins a commitment from the School District of Philadelphia to do a full inventory of water fountains throughout all public schools! It's Official! We've donated over $1,000 to our social justice partners! Thank you for your continued support! Riot Alliance featured on Flying Kite! Flying Kite features Riot Alliance in its "innovation news" section this week! Riot Alliance is thrilled that our social justice business model has been recognized by this amazing weekly online magazine highlighting the people, ideas, neighborhoods, companies and institutions that represent what's next for Philadelphia. Spring is HERE at Riot Alliance! Happy Spring from Riot Alliance! During my graduate studies, I had the privilege of working as an MSW intern with Juntos, a Latin@ immigrant community-led organization based in South Philadelphia, fighting for human rights of workers, parents, youth, and immigrants. Juntos combines leadership development, community organizing, and focused collaborations with other community-based advocacy organizations to build the power of the Philadelphia Latin@ community as agents of change. Juntos has been influential in recent campaigns to revoke the license of the Berks Family Detention Center accused of numerous human rights abuses against Latin@ women and children, and in advocating for restoring Philadelphia's commitment to being a "sanctuary city" for immigrant communities. 10% of all Riot Alliance sales benefit Juntos' crucial human rights work through April! Support Riot Alliance and the work of Juntos by purchasing jewelry HERE. ...that Riot Alliance has donated over $850 to social justice organizations in Philadelphia, PA?!! Purchase your jewelry HERE to be a part of the movement, because working towards revolution is how we SHINE. Fall Happenings at Riot Alliance! Riot Alliance has so many exciting projects happening this fall! From a partnership with YASP through December, to the new display at Adrienne Dara Hair, to teaching a free jewelry class at Achieving Independence Center, to a NEW ETSY SHOP, it's been a busy season!!! Riot Alliance Partners with YASP through December! Riot Alliance is partnering with The Youth Art & Self-Empowerment Project through December, donating 10% of all sales to the organization. YASP is a youth-led organization advocating to stop the trend of automatically trying and incarcerating young people as adults. 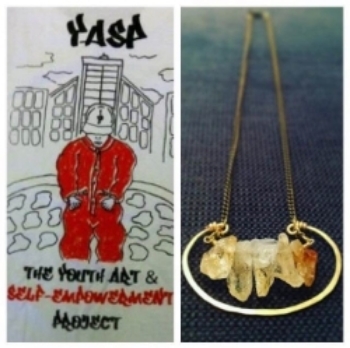 YASP runs workshops in the Philadelphia jails to allow young people who are incarcerated to express themselves and develop as leaders. Young people who have been through the adult court system are at the forefront of YASP, leading the movement to keep teens out of adult prisons. Riot Alliance is thrilled to partner with this amazing community of youth leaders! Make a purchase to support! Riot Alliance now available at Adrienne Dara Hair! 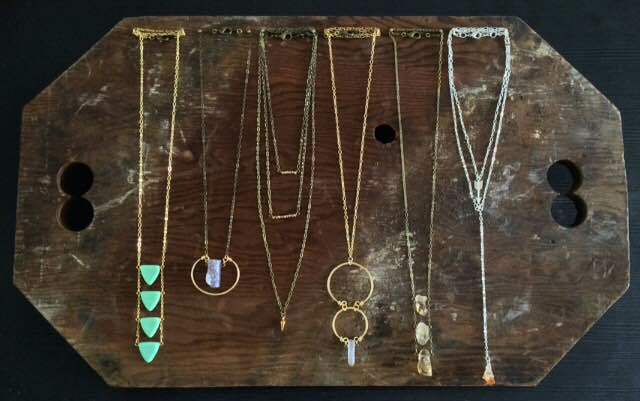 and is now carrying Riot Alliance jewelry! Check out the salon for the best cut and color in the city (in my humble opinion :) and grab some Riot Alliance jewelry too! 10% of all sales in the salon are also donated to Riot Alliance's partner organization. On December 10th, Riot Alliance will be teaching a free jewelry making class for teens at the Achieving Independence Center. AIC is a safe, communal space where youth in dependent care can be connected, educated and empowered as they work toward attaining independence. Teens will learn basic jewelry-making techniques and be able to keep their pieces for themselves or to give as gifts for the holiday season! If you would like to donate supplies for this event, please contact us. Riot Alliance Teams Up with 15NOW Philly! Philadelphia has the highest rate of deep poverty out of the nation's 10 most populous cities. As stated in a philly.com article this past September: "Philadelphia's deep-poverty rate is 12.2 percent, or nearly 185,000 people, including about 60,000 children. That's almost twice the U.S. deep-poverty rate of 6.3 percent." People of color, women, LGBTQ identified, single parents, immigrants, and people with disabilities are overrepresented in low wage work. Philadelphia's current minimum wage perpetuates deep cycles of poverty in an already severely segregated city that is quickly gentrifying with the help of the national and multi-national corporations exploiting their workers with low wages, union-busting, and no guaranteed paid sick leave for workers working less than 40 hours a week. Minimum wage workers' starting salary in Philadelphia is $7.25 and hour. The CEOs of Walmart, McDonalds, CVS, and other major corporations make approximately $7,000 to $9,000 an hour. The US economy has failed working people. The 15NOW movement is standing up for low wage workers everywhere. 15NOW Philly is working to resolve widespread poverty in Philadelphia through mobilizing low wage workers and activists to participate in direct actions, walkouts, and strikes targeting low wage employers in Center City Philadelphia. 15NOW Philly built leadership among low wage workers by canvassing in working class neighborhoods and holding neighborhood planning meetings. In 2014, 15NOW Philly met with 12 City Council members and began a process with Councilman Kenyatta Johnson's office to introduce a $15 minimum wage bill in City Hall. 15NOW has joined the larger fight for economic justice as part of the Raise the Wage PA coalition of community organizations and union workers. 15NOW also collaborates with POWER, SEIU, Fight for 15 PA, and the BlackLivesMatter movement to align struggles of racial and economic justice. Riot Alliance Supports 15NOW Philly from April - June! Riot Alliance is collaborating with 15NOW Philly as its featured social justice organization from April - June. 10% of all proceeds from jewelry sales will benefit the fight to provide a living wage to all Philadelphians, and to raise awareness about the income disparities affecting low wage workers everywhere. Riot Alliance believes strongly in the mission of the 15NOW movement, and the movement's ability to give low wage workers a voice in the fight for workers' rights! Shop online or come out and support Riot Alliance and 15NOW Philly on May 16th at the Trenton Avenue Arts Festival, and June 6th at the Punk Rock Flea Market! Because every worker deserves a living wage. Riot Alliance teams up with Youth Sentencing & Reentry Project for the months of August - October as its featured social justice organization! Co-founders Joanna Visser Adjoian and Lauren Fine recognized the need for improved outcomes for youth in the adult criminal justice system, particularly in Pennsylvania. There is no minimum age at which children can be tried as adults for certain crimes in Pennsylvania, and PA is also the state with the most individuals serving life without parole sentences for crimes committed as children in the world. YRSP improves outcomes for youth in Pennsylvania's adult criminal justice system by advising their attorneys at trial, and by supporting incarcerated youth and their families both during and following their release from prison. Approaching sentencing from a youth-specific lens is crucial to reducing sentencing for youth, and focusing efforts on youth having higher prospects for reform. Read more about this issue HERE. 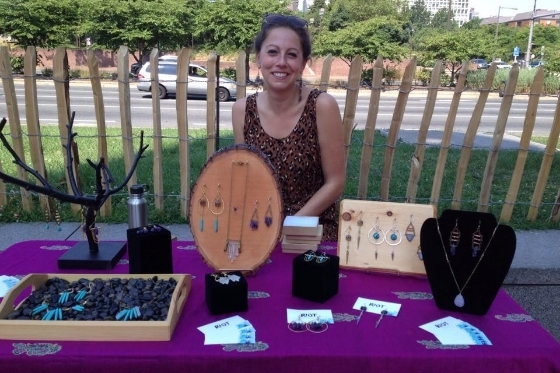 On August 9th, Riot Alliance participated in Art Star's summer pop-up market at Spruce Street Harbor Park to kick off three months of support for YSRP! Riot Alliance looks forward to a great event and a continued partnership with an incredible organization! Let us nourish a future of possibility, not penalization, for our youth. If you would like to donate but cannot the attend the event, click HERE. Want to support through your Riot Alliance jewelry purchase? Place a custom order before November 1st and 10% of the proceeds will benefit YSRP! Place an order HERE. You can also check out Riot Alliance at GETLUCID! at Underground Arts on 10/30. When my good friend Miguel told me he and fellow artists were going to organize an entrepreneurship and art community-education program focused on building a platform for the youth leaders of San Luis, Colorado, I was super excited to get involved. San Luis, Colorado, is not just the oldest city in Colorado; it is set in the majestic 7000 feet high plateau San Luis Valley, surrounded by the magical and sacred Sangre de Cristo mountains and the country of the great Apache people.The setting is the high alpine cultural heartland of the Rio Arriba or Upper Rio Grande Headwaters communities of Spanish-Mexican-Mesoamerican-Native American-Sephardic-Persian-Moroccan peoples otherwise known as Chicanos/Chicanas. During the summer months there are few engaging opportunities for the youth of San Luis, Colorado therefore they often do not see a value to their land and the generational struggle for its sovereignty. This compromises the health of the community and could put the land at risk for exploitation from outside forces that do not have the interests of San Luis and its people in mind. Due to a lack of economic opportunities, young leaders are few and far between in the San Luis community. This leaves a gap between High School aged youth and the elders. Young professionals doing social justice work in other parts of the country may be unaware of indigenous struggles like the land rights struggle in San Luis and the similarities with urban struggles on the east coast. Though ultimately I could not make it to Colorado, Riot Alliance proudly represented Move Mountains Project as its first featured social justice project and donated proceeds from jewelry sales in Philadelphia to help the movement in San Luis! Check out photos, videos, and updates from Move Mountains here!